Healthy Chocolate Chip Cookies was posted on July 11th, 2013 and is filed under Kid Friendly, Recipes, Snacks. This entry has 17 comments. You can follow any responses through the RSS 2.0 Comment Feed. I’m curious. Are there even people who don’t like chocolate chip cookies? I mean, who would pick a cookie with raisins or nuts over a cookie with chocolate chips? Seriously. Do people do that? I’m not against nuts or dried fruit in cookies…but I could never see myself choosing raisins over chocolate chips. Not happening. Ever. I’m just not that good. 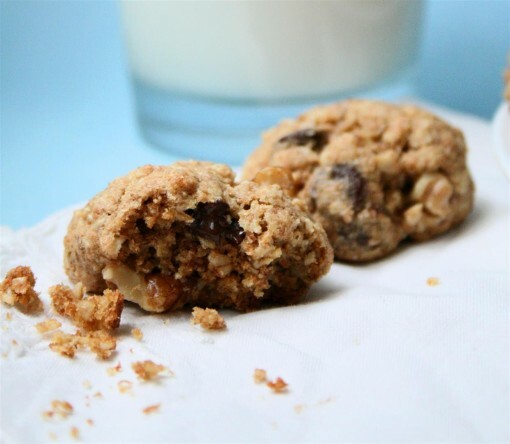 These cookies aren’t low carb, vegan, or gluten free…however; they are made with healthier ingredients like coconut oil and whole wheat flour – there are also some heart-healthy omega-3s with the addition of nuts (yes, nuts are good WITH chocolate chips!) and flaxseeds. These are a great snack or dessert for kids who need a lot more carbs than us grownups. As always, I recommend using organic and whole ingredients as much as possible…especially with flaxseeds and eggs. In a mixer, cream the butter, coconut oil and sugar. Add the vanilla, eggs, salt, baking soda and powder. Fold in the rest of the ingredients. Form small cookie dough balls and place on a greased cookie sheet. Bake at 350 degrees for 10-12 minutes, or until lightly browned. Are you a dried fruit or nut fan with cookies? Or maybe you’re into the chocolate chips (like me)? I love how puffy these cookies are. I always hate when my cookies turn out flat… I’m more of a chocolate chip girl myself, I don’t like nuts or things in my cookies or brownies or breads. Not a fan. They sound good to me! I love chocolate chip cookies, and I can’t turn down a healthified version. These look delicious! I’m definitely into chocolate chips, not so much the dried fruit or nuts. These are beeeeautiful! I love coconut oil in cookies–the texture is amaaazing! Ummmm….I’ll take both please. :) Coconut oil in cookies is the best! I am one of those strange people that do not care for chocolate, especially chocolate chip cookies. I love peanut butter cookies, anything but chocolate chip. Your cookie look great though! Good enough to at least have a bite lol. I LOVE raisins in oatmeal cookies. A personal favourite. I’d actually pick them 2000 times, before I’d pick a chocolate chip cookie. Haha… Weird, right? Glad you got home safely! Yes! I love baking with coconut oil… and butter. :) These look so yummy!! I like lots of walnuts in my cookies, plus some dried cherries, along with some chocolate chips or maybe dark chocolate chunks. More nuts than chocolate, though. I like dried fruit, nuts and chocolate chips in my cookies. I love them all. I’m a recent convert to organic products and natural fats, loved seeing your coconut oil in the recipe, can’t wait to try these out! Hi there. I googled best coalochte chip cookie recipe, or something similar and came across several recipes. Yours looked the closest to what I wanted. There’s a bakery in town that makes the best coalochte chip walnut cookies. They’re slightly dry-chewy-crunchy on the outside and moist-chewy-chocolatey on the inside with at least a walnut bite every other bite So I followed your recipe pretty close, just adding some walnuts and maybe a little less coalochte chips. Also, I didn’t have baking soda and felt ashamed to substitute a larger portion of baking powder. I do not own a mixer so I improvised doing it all by hand. I kept the butter a little colder but it probably is best to do this with a mixer. Despite the inconsistencies, Wow!!! I was not dissapointed. I just ate 2 and a half with a glass of milk. After writing this comment, they’ll have cooled the proper amount of time. I think I’ll go have another right now. Thank you for sharing!